Lowest prices all the time, guaranteed! If you find a better price, let us know. 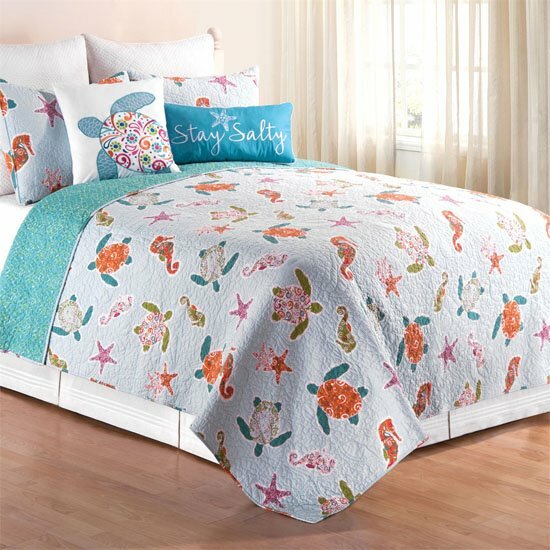 St. Kitts Quilt bedding by C & F Enterprises is a light hearted ensemble of whimsical turtles, seahorses, and starfish done in colorful prints of simple flowers and swirls against a pale blue background. The lively designs have colors of orange, bright pink, green, and aqua. Quilt reverses to a net design in green and white on aqua. St. Kitts comes in a set with the quilt and sham or shams. Add your choice of accessories to style your room. A tailored bedskirt in white with pintuck detailing sets off the quilt, and white matelasse euro shams add another design layer at the headboard. A throw pillow featuring a turtle and a throw pillow with the saying "Stay Salty" offer more decorating options. 100% cotton and machine washable. Pillows are spot clean only. The St. Kitts Twin 2 Piece Quilt Set has a whimsical pattern of turtles, seahorses, and starfish done in colorful prints of simple flowers and swirls against a pale blue background. The lively designs have colors of orange, bright pink, green, and aqua. Quilt reverses to a net design in green and white on aqua. Set includes one twin quilt, 64"W x 86"L and one standard sham 20" x 26". Self binding trim at edges. We offer the complete ensemble in the St. Kitts pattern by C & F. Manufacturer's UPC code is 008246500469. The St. Kitts Full Queen 3 Piece Quilt Set has a whimsical pattern of turtles, seahorses, and starfish in colorful prints of simple flowers and swirls against a pale blue background. The lively designs have colors of orange, bright pink, green, and aqua. Quilt reverses to a net design in green and white on aqua. Set includes one full queen quilt, 90"W x 92"L and two standard shams 20" x 26". Fits full and queen size mattresses. Self binding trim at edges. We offer the complete ensemble in the St. Kitts pattern by C & F. Manufacturer's UPC code is 008246500476. The St. Kitts King 3 Piece Quilt Set has a whimsical pattern of turtles, seahorses, and starfish done in colorful prints of simple flowers and swirls against a pale blue background. The lively designs have colors of orange, bright pink, green, and aqua. Quilt reverses to a net design in green and white on aqua. Set includes one king quilt, 108"W x 92"L and two king shams 20" x 36". Self binding trim at edges. We offer the complete ensemble in the St. Kitts pattern by C & F. Manufacturer's UPC code is 008246500490. The St. Kitts Stay Salty Pillow is embroidered in white with the saying "Stay Salty" on a bright aqua pillow. A happy little starfish accents the pillow. 12"W x 24"L We offer the complete ensemble in the St. Kitts pattern by C & F. Manufacturer's UPC code is 008246502951. The St. Kitts Turtle Pillow features an applique turtle whose shell is embroidered in a colorful design of simple flowers and swirls in orange, bright pink, green, and aqua on a white pillow. 18"W x 18"L We offer the complete ensemble in the St. Kitts pattern by C & F. Manufacturer's UPC code is 008246503255. The St. Kitts Valance has a whimsical pattern of turtles, seahorses, and starfish done in colorful prints of simple flowers and swirls against a pale blue background. The lively designs have colors of orange, bright pink, green, and aqua. Straight rod pocket valance. 15.5"H x 72"W. Unlined. We offer the complete ensemble in the St. Kitts pattern by C & F. Manufacturer's UPC code is 008246503545.